The following companies and individuals have supplied the images used on this web site. The images are a small selection of the resources that are available. They can be contacted directly regarding professional images for further use. If you plan to visit Shetland to view Up Helly Aa, the Visit.Shetland.org website provides excellent information about Shetland accommodation, flights and ferries to and from Shetland, and about the many other activities and attractions that Shetland has to offer. 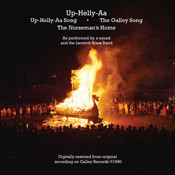 The master tapes of the original 1980 vinyl recording of the Up Helly Songs featuring the Lerwick Brass Band and Registered Squad No 1 have now been carefully restored, digitally remastered and have been released in CD format. It is available for purchase online at www.makingwaves.uk.com.